The Houthi rebellion in Yemen that was already in existence more than five years ago had recently turned into a full-blown conflict that escalated into an international crisis in the first week of April of 2015 when Houthi rebels in Yemen deposed President Abed Rabou Mansur Hadi, throwing him out of the helm of Yemeni government. Hadi fled to Saudi Arabia while the Houthis effectively captured the capital Sana’a. Thereafter, Saudi Arabia, has initiated massive aerial bombings against the de facto Houthi government in Sana’a and in various strategic areas of Yemen that are now being occupied by the Houthi militia. Saudi Arabia, together with its allies in the Arabian Peninsula has justified its invasion into another sovereign territory by claiming that they want the Houthis to return the reins of power back to the erstwhile government of President Hadi. However, it is really interesting to notice that the unilateral Saudi interventionism in the internal affairs of Yemen may have deeper reasons other than the above claim since the United States and its allies in the Arabian Peninsula are actively supporting this Saudi initiative of undeclared war against Houthi de facto rule in Yemen. It is as clear as the midday sun that US plays a great role in Saudi’s armed interventionism in Yemen. It is indeed a wonder why Saudi Arabia and its allies against Houthis have not taken any confrontational military action against the ISIS of Iraq and Syria when the so-called “Islamic State” committed heinous crimes against Arabs and Kurds in these areas. Saudi Arabian armed forces did not invade nor bother to bomb even one ISIS camp in Iraq, Syria and the Levant when the inhumanities that this so-called “Islamic State” has done and is still continuously inflicting up till now against Sunni Muslims, Shi’a Muslims, Sufi Muslims, Christians as well as against Yezidis were far more brutal, far more cruel and far more heinous compared to any acts committed by other rebel movements in the Middle East, Houthi rebels of Yemen included. It is very telling to note that America immediately and directly condones the undeclared war and unilateral military interventionism of Saudi Arabia against the Houthis, whereas US and Saudi Arabia did not do anything that can be construed as serious military operations against ISIS in Iraq, Syria and the Levant. The reason why the USA is enthusiastically supporting the undeclared war of Saudi Arabia against the Houthi rebels in Yemen is clearly geopolitical: imperialistic design to control the politics and the economy of Yemen, and eventually the Gulf states in the Arabian Peninsula, by using Saudi Arabia as its more than willing proxy warrior. The US strategic plan for the Middle East in general, and in the Arabian Peninsula and Gulf countries in particular, is to exploit the volatile situation of the region, by initiating regime changes, by manufacturing dissent and by financing proxy wars so that the US can, in effect, hold each nation-state by their necks and thus realize its imperialistic intentions in these countries so that US can make these countries subservient to its hegemonic dream of controlling the geopolitics in this region (for example; military and economic control of the sea lanes in the Persian Gulf, the Arabian Sea, Mediterranean Sea and the Red Sea using military and tactical cooperation with US’ allied regimes in these regions) and controlling economic resources: fossil fuel being the foremost resource in these countries. We can now observe that Yemen’s situation is truly hazardous from the point of view of international politics, and the ultimate result of this US-Saudi interventionism upon Yemen is indeed perilous for Yemen and for its people. It can be accurately predicted that US-Saudi interventionism in Yemen if absolutely successful, may have the same tragic results as that of present-day Libya, Iraq, Egypt and Afghanistan—these nations are now failed states, thanks to the unabashed and unabated US military intervention in these countries! Saudi Arabia is an authoritarian and totalitarian theocratic monarchy. 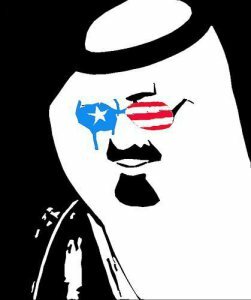 Despite of this, US continues to actively support Saudi monarchy even though the latter’s government is one of the most undemocratic dictatorships among nation-states in the entire Middle East! The sad truth is that US never cares to propagate democracy in the Middle East, contrary to what is being harped and proclaimed far and wide by the Western mainstream media outfits that are unthinking supporters of the already discredited CIA propaganda called “Arab Spring”. The glaring proof that US is not interested in the democratization of the Middle East is the fact that the US supports the most corrupt and cruel dictators of the world: the dictators of the Middle East first and foremost—for so long as these tyrants actively support the continued US hegemonization in the region! And in return, these dictators and tyrants in the Middle East must pay absolute allegiance to US hegemony in order to be assured of US support against internal democratic movements within and domestic rebellions that are constantly besetting their totalitarian regimes. The old adage, “it takes two to waltz or tango” proves to be an apt and veritable depiction describing the reciprocal, co-dependent, symbiotic yet parasitic relationship between US hegemony and the corrupt monarchs and dictators in the Middle East region.